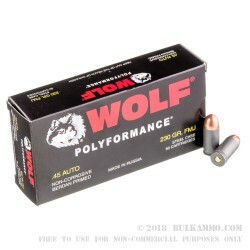 Wolf Polyformance .45 ACP features a bi-metal (copper/steel) full metal jacket projectile and a polymer sealed neck and Berdan-primer in a non-reloadable steel case. Though you can only use this ammo once, you would be hard-pressed to find a cheaper way to practice with your 1911. 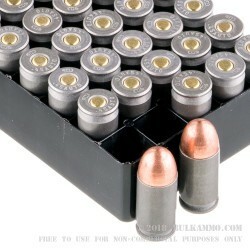 Order your 500 round case today! Wolf is confident that if you try it, you'll like it. That's why they have a 100% Satisfaction Guarantee and promise to cover the cost of the return and will refund you for the ammo you return. Wolf Polyformance .45 ACP is made in Russia for import to the United States. You really do get what you pay for with this ammo. I have had a number of FTF and stovepipes with this due to grain inconsistency. However, you have to look at it as a use scenario. If you are shooting at the range, no problem. If it's for home defense, that's an entirely different issue. THIS IS RANGE AMMO. 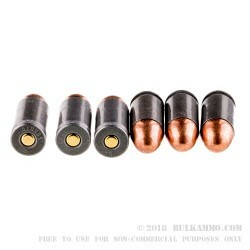 Select PMC or Federal for something that will give you a 1:1 trigger pull to target hit ratio.